Oxen hauling coffee harvests in La Sierra, Platanares, Costa Rica. The warm red earth pulls me in, as I follow FUDECOSUR loan officers on their labor of love. Serpentine paths lead us through farm lands carved out of dense swaths of jungle, as borrowers take us to the plots of land they proudly cultivate, thanks to the help of Kiva lenders. As I slip and surf along steep paths slick and thick with monsoon rain, sprawling ferns the size of a family hut, reach out to us, with unfurled leaves heavy with the same mist that envelopes us. Majestic white oxen haul mighty harvests out of the valley depths, where machines dare not tread, due to thick, quicksand clay mud, which all too lovingly pulls all things passing, toward the womb of the world. 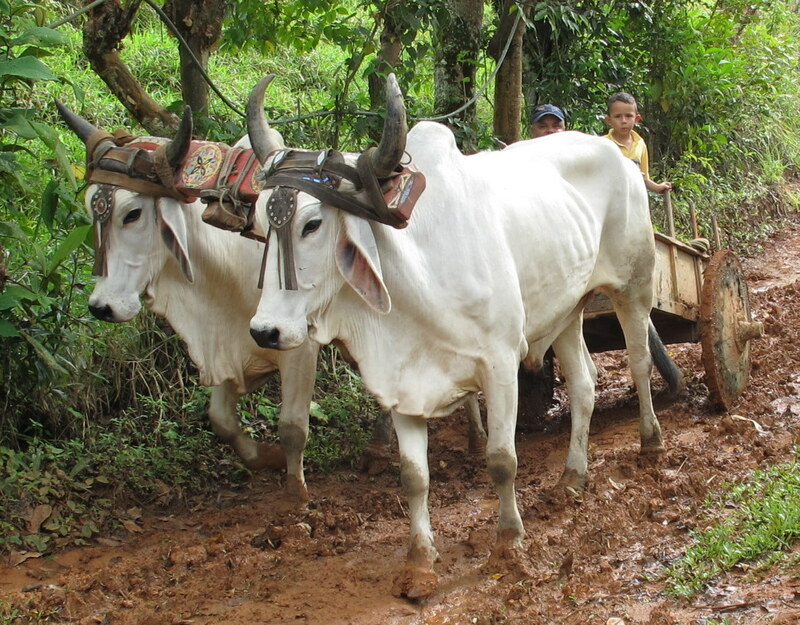 We move to the side of the path, making way for the heaving beasts of burden, as they pull weighty sacks of coffee beans and other food crops, in brightly painted “carretas” (wooden carts with wooden wheels). Continuing along our trek, we descend into a warm, moist Eden of lush green, where water-collecting trees grow taller and stronger as we approach the river. “Welcome to La Sierra! 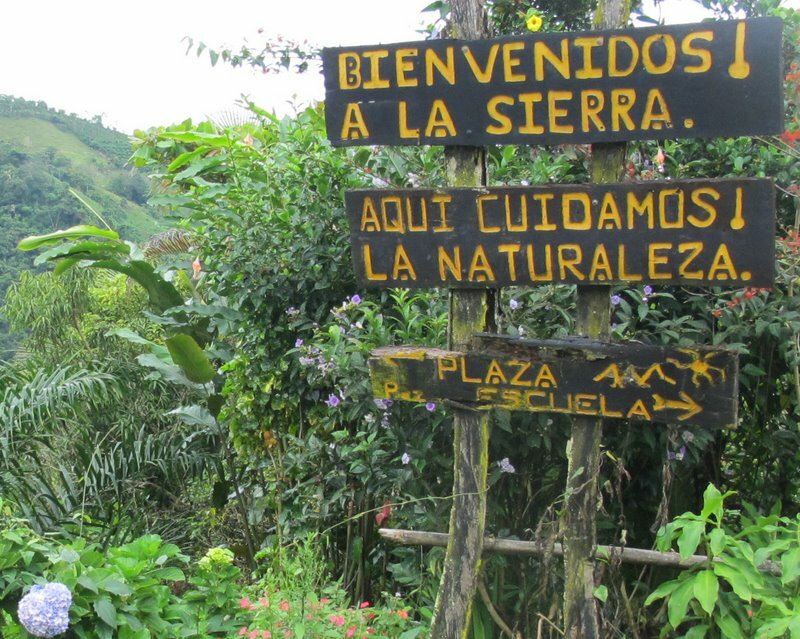 Here we take care of nature!” – Village welcome sign in La Sierra, Platanares, Costa Rica. Unlike farms I’m used to seeing in the United States, Costa Rican farms boast fields of crops coexisting with an abundance of medicinal plants and native trees, which are protected by law. True to Costa Rica’s conservationist spirit, owning land means that one is charged with protecting existing plant species essential to long term survival, while cultivating crops essential to immediate survival. Cutting down old-growth, or endangered trees, or trees which sprout, stretch and rise along rivers, is strictly punished by hefty fines and jail time. These rules apply even if one destroys any such tree on land one owns. The result? 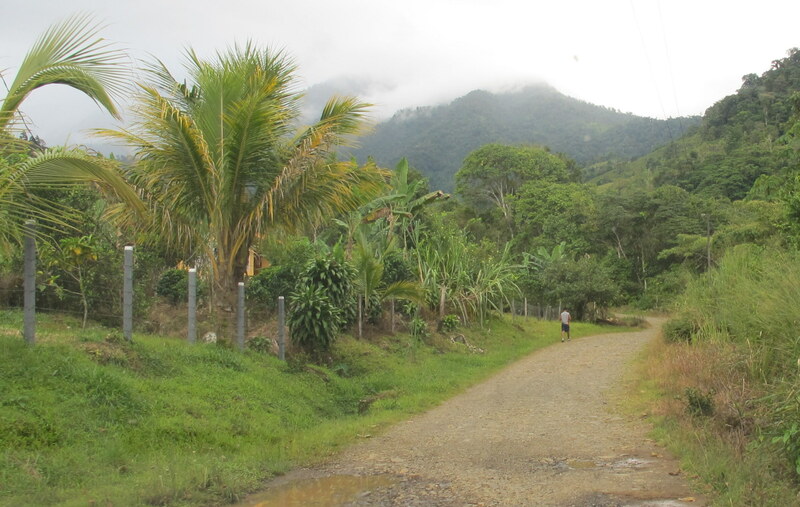 Farming in Costa Rica is no longer synonymous with deforestation. Because of the great care that has been taken to preserve the environment, Costa Rica has become a Mecca for biologists and laymen lovers of wildlife. The nation boasts the largest percentage of protected land in the world (25%, compared to the developing world average of 13%, and the developed world average of 8%). While making up only 0.25% of the earth’s land mass, Costa Rica is home to 5% of the world’s biodiversity. And though such animals are nearly extinct in neighboring countries, large jungle cats, a variety of monkeys, reptiles and amphibians, and an abundance of bird species and marine turtles, survive and thrive in the ecologically rich coast that is Costa Rica. Oxen hauling farmer and son to coffee fields - La Sierra, Platanares, Costa Rica. Protected land swells and wells with sweet, crystalline springs, rolling rivers, tumbling white waterfalls, lakes, mangrove swamps and marine estuaries brimming with life. Due to a deep respect for the earth, exceptionally clean water and fresh air blanket the country, and are a great source of pride for Costa Ricans. Those who work the land are especially proud of it, and in the eyes and smiles of Kiva borrowers and FUDECOSUR loan officers, beams a joy and passion that comes from living a labor of love. Not only are FUDECOSUR village banks run by village farmers, as detailed in Bank-O-Mat Under a Hot Tin Roof, but they are also trained and managed by loan officers who are farmers themselves. As FUDECOSUR seeks to assist and develop agricultural communities by becoming an integral part of each community, FUDECOSUR’s loan officers provide much more than a mere financial services relationship. Since loan officers Geiner Gonzáles Marín, Gerardo Barrantes and Danny Zuñiga all come from farms themselves, they also serve as valued partners, advisors and mentors, not only from a bank operations training and guidance perspective, but also with regards to helping clients optimize crop and livestock output. Geiner Gonzáles Marín entering a coffee farm in La Sierra, Platanares, Costa Rica. 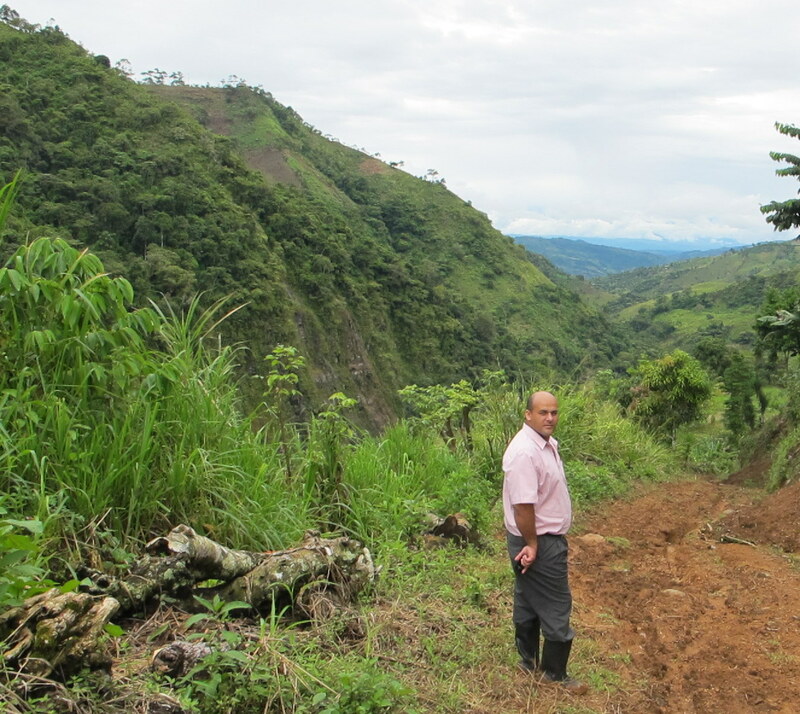 When visiting borrowers and the lands they cultivate, Chief Loan Officer Geiner Gonzáles Marín, often leads the trek into plunging valleys or up steep mountains, with unceasing enthusiasm. Born and bred on a coffee plantation with dairy cows and various food crops, Geiner is in his element and is unstoppable –copious rain or shine. With an absolute passion for the land and the fruits of farmers’ labor, his camera is always in hand, snapping photos of crops grown with Kiva loans. He also interviews the farmers with great interest, inquiring about crop cultivation challenges (such as destructive wilting or fungus caused by excessive rain), and offers vital suggestions on how to combat various crop infirmities and increase crop yields. Sharing the same intense passion for the land, loan officer Gerardo Barrantes shows off photos of gigantic yucca and ayote crops he’s produced organically. 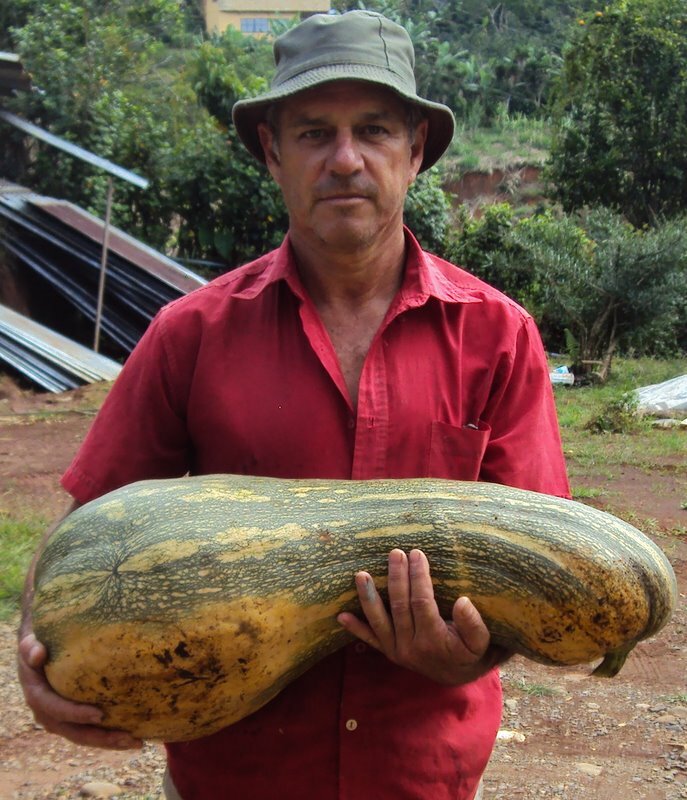 Clients are wowed by the 37-pound mega-vegetable Gerardo proudly cradles like a newborn child. While eagerly inspecting and praising crops produced by Kiva borrowers, he offers guidance on stronger, more rain-resistant produce likely to benefit from organic farming methods. Gerardo’s love of the land is also reflected in his paintings. One features his childhood home – an evergreen dairy farm, fed by fresh spring water, cascading from the mountains shadowing his boyhood village. 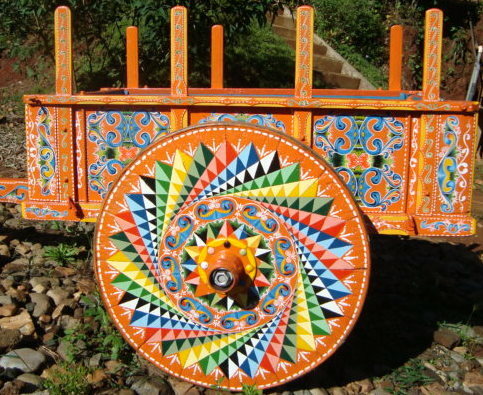 Gerardo’s artisan talents are also used to turn “carretas” (ox-drawn wooden carts) into rolling works of art, for the proud farmers in and around his village. 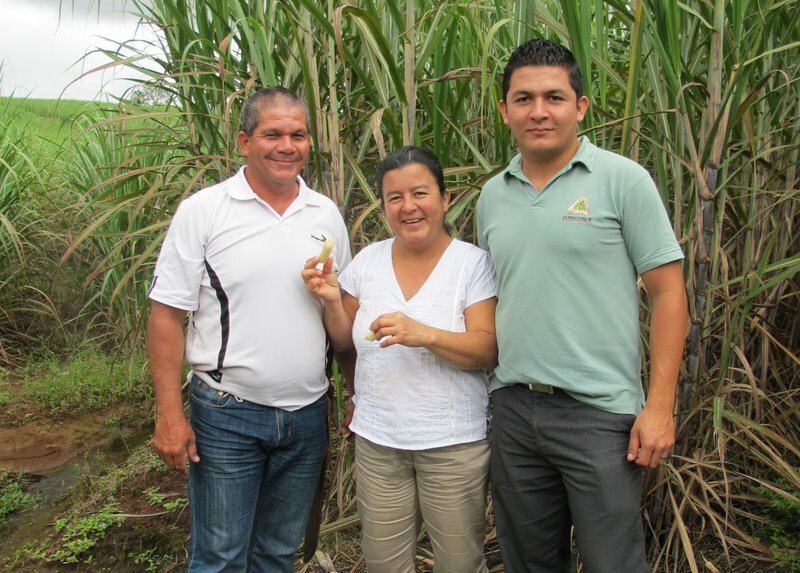 Danny Zuñiga (far right) with his proud parents in the family sugar cane fields - Pilar, Costa Rica. Like his counterparts, loan officer Danny Zuñiga has always had a deep desire to remain close to the land, and the people who tend it. As a small child, Danny’s mom jokes that it was hard to get him excited about school, since he preferred spending time with dad in the family sugar cane fields. True to his passion, Danny enrolled in an agriculture-based vocational school program. From grades 7-12, Danny bussed his way to Colegio Tecnico Profesional de Platanares, which has a working coffee farm, and livestock farm full of cows, pastures, pigs and rabbits. Just like his colleagues, Danny’s favorite part of the job is being out of the main office, and in the field with borrowers. As such, Danny is especially proud to help serve client needs with his agronomy training, both in theory and in practice. FUDECOSUR provides these free courses not only as a form of long term community development, but also believes that such courses are responsible for client loyalty and very low default rates (2% reported for 2010). The more involved FUDECOSUR is in the village bank communities, the greater affinity clients feel for FUDECOSUR as a member of their community, and the more willing and able clients are to repay loans (per FUDECOSUR’s philosophy). Furthermore, borrowers who are taught methods to improve production, make stronger clients and business partners in the future, since they’ll eventually have more income resources. Working “carreta” painted by FUDECOSUR Loan Officer Gerardo Barrantes. Beyond working to provide agricultural communities with formal and informal business development guidance, FUDECOSUR loan officers also train farmers to run village banks, which operate in the communities where farmers reside. With dedicated mentoring and guidance from loan officers, FUDECOSUR’s Village Banks (also known as Credit Committees) are run by 5-7 dedicated volunteers, who are elected every 2 years by members of their community. Partnering with FUDECOSUR’s loan officers, Credit Committees are responsible for assessing and approving loan requests, disbursing loans to borrowers, collecting loan payments, documenting all credit requests and exchanges, and monitoring borrower progress. Credit Committees are also charged with educating their community members on FUDECOSUR rules and requirements for soliciting, receiving and repaying loans. 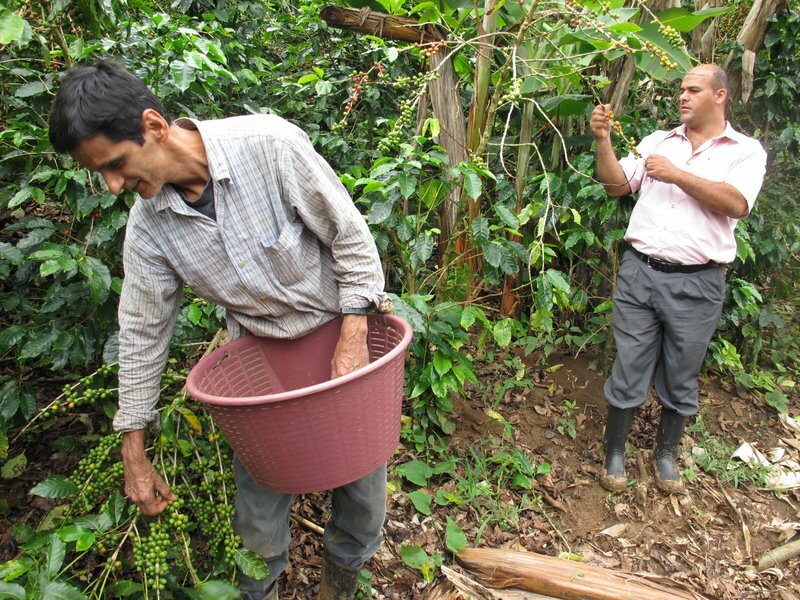 Geiner Gonzáles Marín (right) inspecting and gathering coffee beans for Kiva borrower Rigoberto Garro Godinez - La Sierra, Platanares. 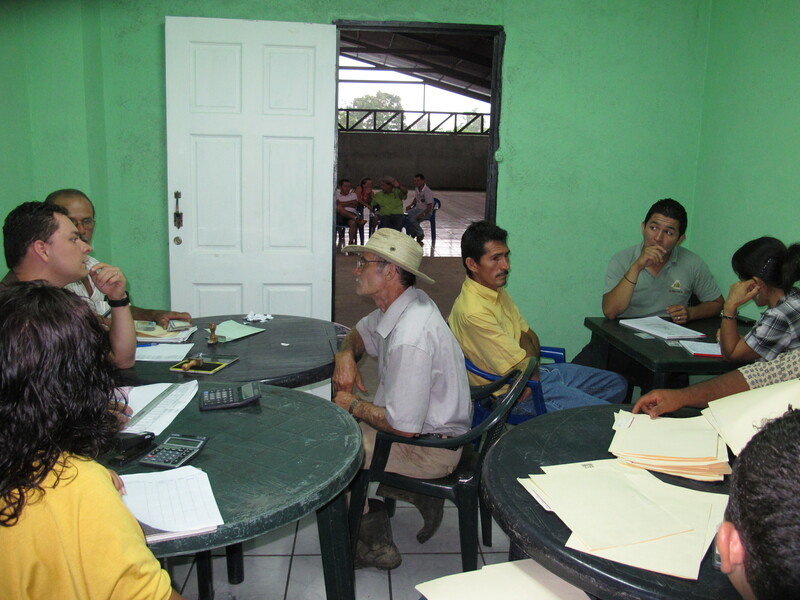 Given their intimate knowledge of the land, FUDECOSUR loan officers are deeply respected and revered by clients as fellow farmers, who bring much-needed credit funds and education to underserved communities. “Geiner is one of US!” Village bank members of Cedral de Cajón exclaim (referring to the Chief Loan Officer). Since agricultural communities are commonly excluded from traditional financial services, the introduction of FUDECOSUR funds and training has given clients a renewed sense of hope, pride, and excitement. Many FUDECOSUR clients recant tales of suffering through intimidating, confusing and lengthy application processes for traditional bank loans. After losing money to travel costs, and crops left unattended for multiple visits to national banks, farmers are often left disheartened by rejection at the end of the process. After struggling unsuccessfully for years to obtain national bank loans to support his farm, Antonio Vargas Hernandez, is now Vice President of FUDECOSUR’s village bank in Cedral de Cajón. 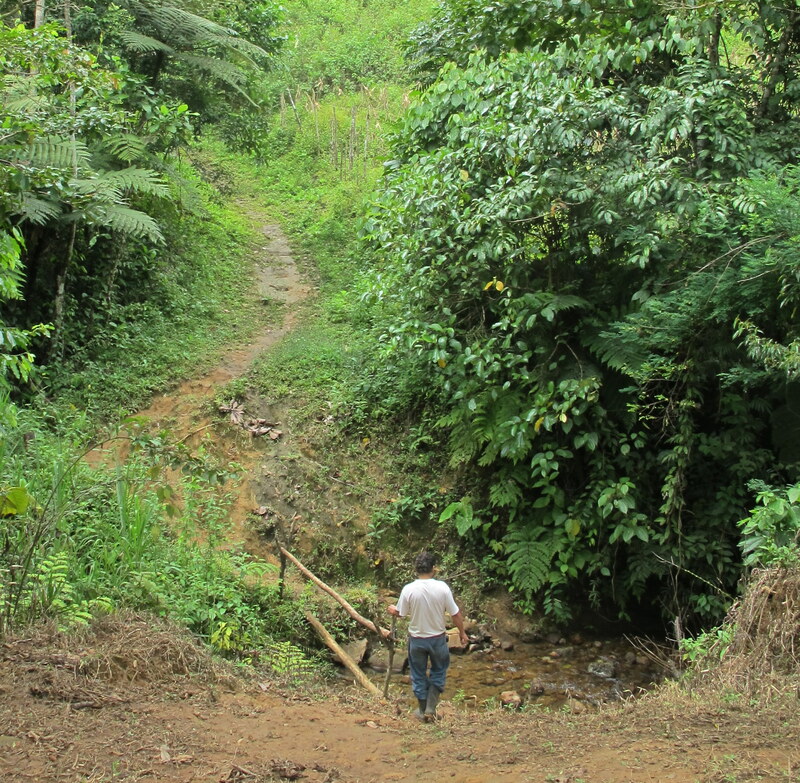 Geiner Gonzáles Marín descending into the valley of La Sierra, Platanares to reach a Kiva borrower’s coffee farm. The complexity of the national bank loan process, plus the constant rejection of farmer applications, made many farmers feel inadequate and incompetent when seeking credit. In contrast, FUDECOSUR has taught clients that they are not only valued borrowers – they are also essential, competent and capable financial services partners. As farmers with intimate knowledge of the land, and personal experience with members of their community, Credit Committees are well-suited to decide which business proposals are most apt to thrive from a micro-loan. If an unprofitable business proposal is presented (such as planting crops in areas not conducive to successful crop production), the hands-on farming expertise of Credit Committees is leveraged, to help prospective borrowers come up with alternative proposals, which will generate positive growth, and help borrowers thrive. Because of FUDECOSUR’s inclusive village banking model, farmers who formerly perceived themselves as financially illiterate, have become highly functional village bank operators who now beam with confidence. Miguel Mora Vargas, Treasurer of Cedral de Cajon’s village bank, explains how loan officers lead by example, and are a great source of inspiration for village bank officers, who are also borrowers themselves. 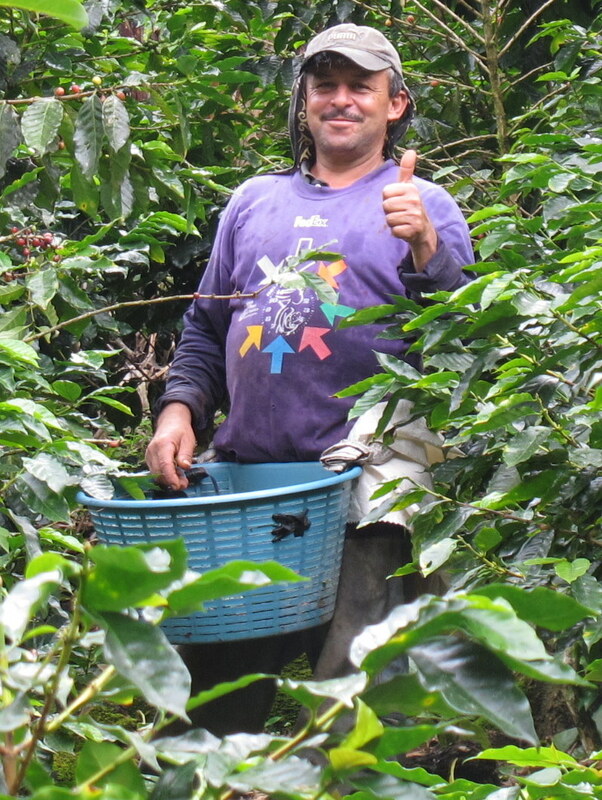 Thumbs-up and smiles from a proud coffee farmer - La Sierra, Platanares, Costa Rica. As village bank operators express their gratitude for FUDECOSUR’s inclusive and educational community development model, monsoon rains often thunder down outside, making a mighty rap-a-tap-tap chorus of sound, which mimics roaring applause. 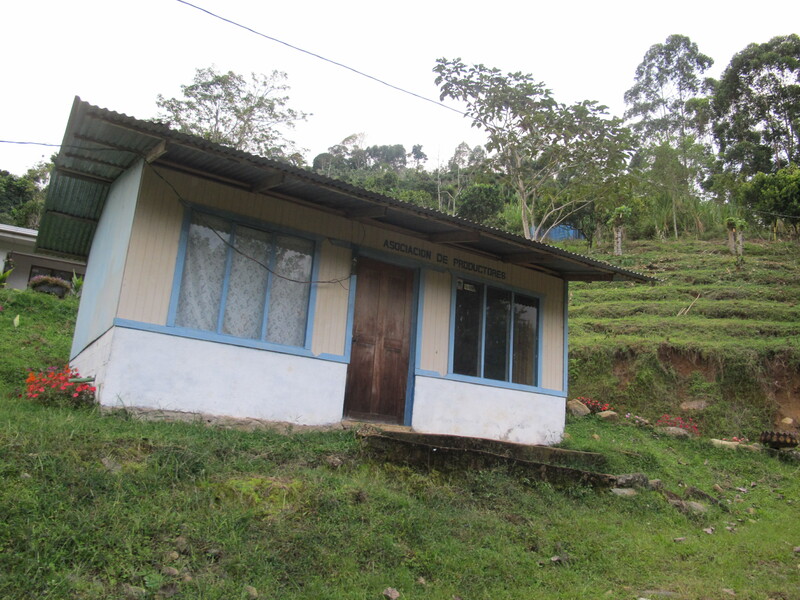 Cedral de Cajón is just one of many communities expressing deep thanks for FUDECOSUR credit services, and the Kiva loans that help make them possible. Time and again, I have the pleasure of seeing borrower hardships converted into eventual successes through Kiva loans, and I redefine the concept of wealth every time. Most FUDECOSUR borrowers, due to their isolated location, have never had a relationship with a national bank, and therefore, don’t even have savings accounts. They are subsistence farmers who don’t become financially rich with Kiva loans, but who are able to maintain crops and cattle for more consistent production, or grow their businesses when weather and market conditions are optimal. With each new loan received (after years of exclusion from traditional financial services), FUDECOSUR borrowers feel that their work is valued and more important than ever. With each successful harvest supported by Kiva loans, farmers stand taller. Single mothers raising pigs which give birth to litters of 6, or chickens producing piles of healthy eggs, radiate with a newfound belief in themselves as capable and successful providers for their children. 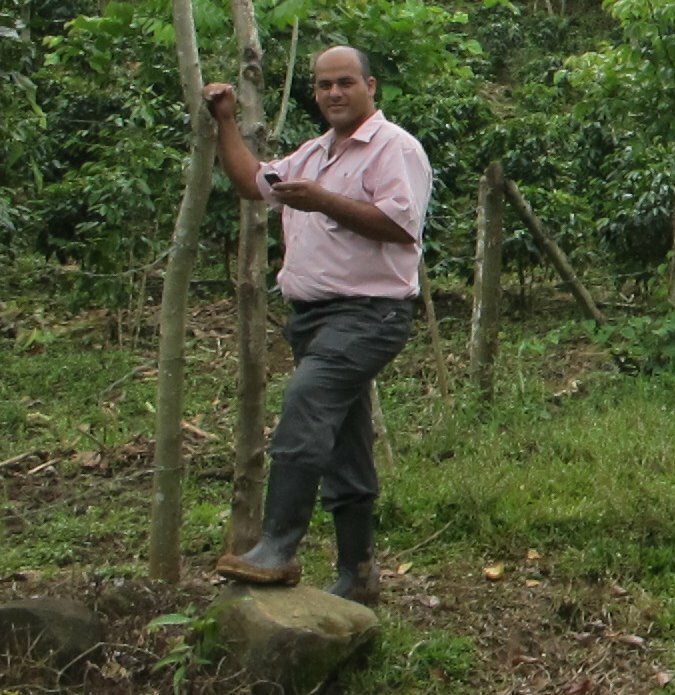 Sons producing more abundant coffee beans or corn with nutrient-rich fertilizers, beam with pride, as they are able to care for aging parents, and feel confident about supporting a future family of their own. What price tag can you place on the renewed sense of life, optimism, enthusiasm and excitement that comes from feeling valued, confident, competent, capable and hopeful? The value, in my humble opinion, is priceless. And though life is not easy for these hardworking borrowers, they are growing wealthy in many ways human beings should be, thanks very much in part, to generous Kiva lenders. Lend to a Kiva entrepreneur today! Apply for the Kiva Fellows Program! Join the FUDECOSUR lending team! Julie Kerr is Kiva Fellow serving in San Isidro, Costa Rica. She currently supports FUDECOSUR (Foundation for the Development of Southern Communities). FUDECOSUR is a non-profit microcredit provider, dedicated to empowering Southern Costa Rica’s disenfranchised agricultural sector. So goes the rockin’ and rollin’ commute to remote villages along dirt roads – speckled with basketball-sized boulders, and craters large enough to swallow a small man (that’s where the “WHUMP!” comes in). Maneuvering these roads with a grin and gusto are FUDECOSUR’s dedicated loan officers: Geiner Gonzáles Marín, Gerardo Barrantes and Danny Zuñiga. Our destination for each turbulent trip is one of FUDECOSUR’s 45 village banks – which provide the only source of much-needed credit most clients have ever had. THANK YOU to all Kiva lenders who help make this possible! As we zig-zag along winding roads trying to avoid the mammoth “WHUMPS!”, we run into traffic. Blocking our path is a fearless bull unspooked by our roaring engine. He stares us down as if to say: “This is my road, buddy, and I refuse to moooooove”. As we inch forward, gently nudging his bum with the bumper, he finally decides to amble on. Then our ascent is blocked by a bulldozer shoveling landslide debris off of the road. While we wait, I savor the warm sounds of humming insects, and whispering laughter from palm leaves rustling in the wind. I take in the views of lush, green valleys and farmland terraced along the hills and rising mountains. Coexisting with carefully planned crops of fire red coffee beans, sugar cane, corn, and legumes, are patches of wild, unclaimed land full of sweet lemon trees (yes – the lemons here are sweet), bright fuchsia bananas (which are mostly eaten by the birds) and miniature yellow bananas (which humans find sweet and delicious). Wild avocado and coconut trees can also be found, and like the sweet lemons and baby bananas, they are free to those who wish to indulge. Have I landed in Heaven?? Our vehicle lunges forward, and I’m whisked out of my glassy-eyed daydream of staying here forever. We pass pristine waterfalls tumbling down the mountain, across the road, and down into whitewater rivers which snake through the valley below. Aaah… slipping back into my daydream again… I’ve grown so accustomed to the rhythm of the roads that the “Bump-duh-duh-thump-thump” now serves as my lullaby. WHUMP! We arrive at the village bank. Perched on a verdant plot of land amidst pastures of feeding cattle, or rising food crops stretching toward the sun, are many of FUDECOSUR’s village banks. Some village banks are simple one-room structures with a burning tin roof shading us from the elements. Other village banks operate out of a farmhouse kitchen or living room. All village banks are a part of FUDECOSUR’s mission to bring financial support to the doorsteps of disenfranchised populations. Due to the isolated nature of the farming communities we visit, most residents have never had a savings account. The absence of national banks in these remote areas has excluded much of the agricultural sector from financial savings and borrowing opportunities. In order to qualify for a loan, national banks often require costly cash deposits – which most farmers can’t pay, since they rarely have savings accounts. Without access to savings accounts, farmers often purchase a pig or a cow with remaining cash. These animals serve as the farmers’ insurance plan, and are sold when large sums of money are needed for emergencies (such as unexpected medical expenses). While farmers are able to subsist without access to credit, it is extremely difficult, at best, to increase living standards or to recover from natural disasters (such as floods or blight) or major health emergencies. Filling this vast credit void is FUDECOSUR (Foundation for the Development of Southern Communities) – A non-profit microcredit provider, dedicated to empowering Southern Costa Rica’s agricultural sector. Besides providing loans for expansion of crops and livestock, FUDECOSUR also provides Family Well-Being loans, which cover medical, educational and home renovation expenses. Such loan diversification ensures that struggling farmers are not forced to sacrifice one essential need (such as money to purchase seed and fertilizer) for another (such as money to pay for life-saving medical treatment). To facilitate easy repayment based on agricultural development and sales cycles, FUDECOSUR offers loan terms of up to 3 years, with annual rather than monthly principal repayment terms. Loan terms are also restructured to help borrowers overcome crop and cattle losses from natural disasters (such as floods and blight), and financial losses due to health emergencies. To ensure credit services are easily accessible, affordable and sustainable, FUDECOSUR literally brings banks to remote villages in need. Leveraging dedicated volunteer networks, existing social infrastructure and building facilities, FUDECOSUR maintains low operational and servicing costs, and minimal environmental impact, while building community cohesion, and opportunities for community members to thrive. How The Village Banks Operate: Volunteer Power! Village Bank operations in action: Santa Elena, Región Brunca, Costa Rica. Tables to the left serve clients repaying interest, while tables to the right serve clients soliciting or receiving money for new loans. FUDECOSUR’s Village Banks (also known as Credit Committees) are run by 5-7 dedicated volunteers, who are elected every 2 years by members of their community. Partnering with FUDECOSUR’s loan officers, Credit Committees are responsible for disbursing loans to borrowers and collecting loan payments. As farmers with intimate knowledge of the land, and personal experience with members of their community, Credit Committees are also charged with deciding which business proposals are most apt to thrive from a micro-loan. If an unprofitable business proposal is presented (such as planting crops in areas not conducive to successful crop production), the hands-on farming expertise of Credit Committees is leveraged, to help prospective borrowers come up with alternative proposals, which will generate positive growth, and help borrowers thrive. Where The Village Banks Operate: Mi Casa Es Tu Casa! To ensure zero resources are spent on office construction, rent or maintenance, Village Banks operate out of existing community structures, such as a tin-roofed central market shelter, or the homes of Village Bank (Credit Committee) members. And, since Village Banks operate in villages where borrowers reside, clients avoid costly money and time expenditures, required for travel to distant towns or cities (where national banks reside). In short, the proximity of the village banks to clients ensures unprecedentedly easy and consistent access to credit services. When The Village Banks Operate: After The Cows Come Home! To accommodate the demanding work schedules of agricultural borrowers, Village Banks meet every 2 weeks, on recurring set dates (i.e. : every first and third Tuesday of each month). Bank meeting times start in the late afternoon (2pm, 3pm or 4pm) to allow borrowers to meet essential crop cultivation and livestock care demands. As such, borrowers are able to access credit services without sacrificing critical production tasks and wages. At each meeting, debt principal and interest payments for existing loans are collected, while money for new loans is solicited and disbursed. After the 3-4 hour bank meeting ends, we bid warm farewells, with new loan profiles and hopes for better futures in hand (thanks to the generosity of Kiva lenders). By the time the loan officer and I reach home (FUDECOSUR headquarters in San Isidro), a 10-13 hour day will have passed. Once I reach my cozy, tin-roofed apartment, echoes of “Bump-duh-duh-thump-thump WHUMP!! !” serenades will lull me to sleep, and ring out again at the start of my next adventure.